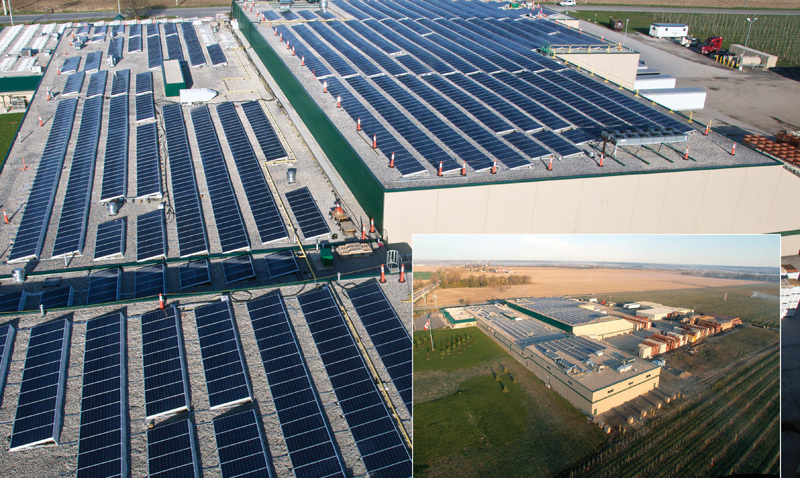 Canada's largest independently-owned apple grower and packer, Algoma Orchards, has installed a rooftop solar energy system at its Ontario processing facility and is reaping the energy benefits. It seemed like construction of Algoma Orchard's new apple processing plant had no sooner been completed than people in pickup trucks started pulling up, trying to sell them a rooftop photovoltaic solar system. "They didn't know anything—it was almost laughable," said Kirk Kemp, Algoma's president and a fourth-generation apple grower near Clarington, Ontario. Ontario is one of Canada's leading provinces in solar power generation. "We weren't letting anybody up there who didn't have a full guarantee." Kemp said the building wasn't constructed with solar in mind, but he admitted that the large, flat roof lent itself to PV. A friend suggested he investigate RESCo Energy Inc., which designs and installs PV systems. After all, the friend said, Flynn Canada Ltd., the company that installed Algoma's roof, had a strategic investment in Mississauga, Ontario-based RESCo. "If you have a good track record, which Flynn does, and have a good business plan, it makes sense," he said. "It wasn't extraordinarily difficult at all. When you first come up with the idea, you have to get everything in place, and once you do, you don't have any trouble." Algoma Orchards ended up with a 543 kW PV system that, upon completion, was one of the province's largest solar roofs. The Gibson and Kemp families behind Algoma Orchards have been growing apples in Durham, Ontario, since 1964. As the largest independent apple grower and packer in Canada, Algoma cultivates 28 different apple varieties on about 500 acres and packs about 1 million 44-pound boxes annually for the fresh market. Apples that are misshapen, undersized, or just not quite up to the quality demanded by the fresh market go into juice or cider. Each year, the company presses about 1.8 million gallons of cider and juice combined. Although apple harvest lasts only a matter of weeks, fresh fruit shipments and juice and cider processing continue year-round. To supply that demand, Algoma puts apples into cold storage and controlled-atmosphere storage and pulls them out as needed. In 2009, the company had a new state-of-the-art 115,000-square-foot building constructed to house offices and its fresh packing and processing lines. To help reduce cooling losses and insulate against heat, much of the building is constructed of concrete. Although the apple grower-packer-processor doesn't have a formal stewardship plan, Kemp said the company still tries to adopt environmentally friendly practices. "We try to be a leader in the apple business," he said. In 2011, for example, Algoma Packing installed—on its pre-sorting line—the first-ever large-scale water recycling system in a North American fresh produce plant. Algoma to cut water use by up to 80 percent and save about five million liters annually. For its efforts, Algoma received the Ontario Ministry of the Environment Minister's Award for Environmental Excellence, Small Business Category, 2011. Algoma's PV project was developed under the Ontario Power Authority's FIT—or feed-in tariff—program, said Michelle Bird, RESCoEnergy project manager for the Algoma installation. The FIT program was the result of the Green Energy and Green Economy Act of 2009, and Ontario's Long Term Energy Plan of 2010. It was designed to provide long-term financial assuredness to companies wanting to invest in renewable energy generation facilities. The rules apply to PV projects between 10 kW and 10 MW, as well as other renewable energy projects built in Ontario. As part of the program, Ontario Power negotiates 20-year power-purchase contracts with energy project developers. The fixed prices are posted on the authority's website. That way, project developers know up front the revenue potential so they can calculate return on investment. The FIT program also contains requisites for developers, such as a 60 percent minimum domestic content for PV projects. Meeting that minimum isn't nearly as difficult as it once was because the program has stimulated local manufacturing, Bird said. "So there are a lot of manufacturers we can choose from here for components," she said. RESCo acted as the engineering, procurement, and construction (EPC) contractor on the Algoma project. It will also provide long-term operations and maintenance. In addition, RESCo has long-term relationships with BrightRoof Solar LP—a partnership between CarbonFree Technology Inc. and Connor, Clark & Lunn Infrastructure, both of Toronto, she said. In March 2011, BrightRoof announced it planned to invest $100 million during the next two years to fund solar projects—including Algoma's—that participate in the FIT program. Algoma's project was developed by CarbonFree and is owned and operated by BrightRoof Solar. Bird said the permits required to install the solar project weren't any different from those needed for any other commercial development. Although the roof's basic structure did not need reinforcement to accommodate the additional weight of the solar panels, she said engineers recommended a new roof be installed so its durability would match the 20-year guarantee on the panels. They determined the project's size at 543 kW DC by taking the roof's square footage and subtracting out physical obstructions and shading. The calculations yielded a total 1,940 PV modules to cover the area. The polycrystalline silicon modules were manufactured by MEMC of Newmarket, Ontario. 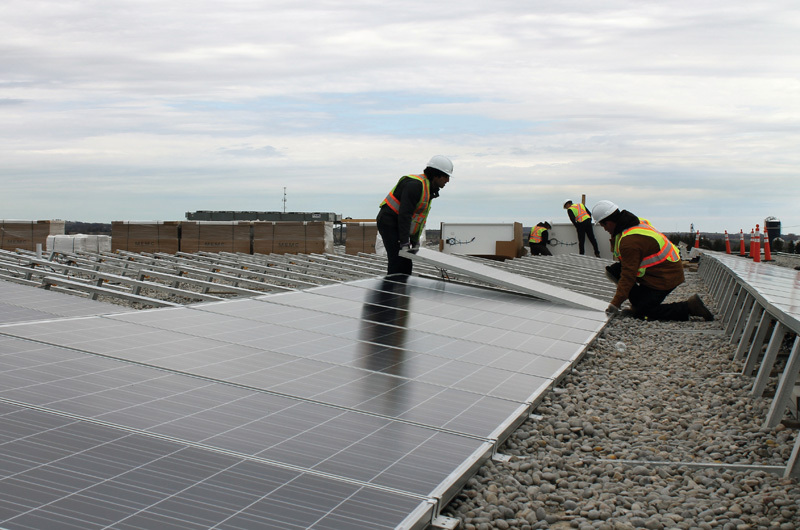 The modules were installed on ballasted racking from SunEdison Canada in Scarborough, Ontario, at a 10-degree angle, which was a compromise between ballast requirements and solar production. "If you raise the angle, that increases the wind load requirements, so you have more opportunity for up-lift," Bird said. That, in turn, would require more ballast. But an angle of 20 percent or even 25 percent would produce more electricity. A structural engineer and an array layout engineer were brought into the discussion to determine the ultimate angle without penetrating the roof. Three inverters from PV Powered in Mississauga convert the DC current to AC. Bird said they were fortunate they didn't have to upgrade any of Algoma's electrical connections to accommodate the electrical generation. RESCo has its own in-house crew that's "very experienced" with solar installation. "If there's ever a question, they can easily call the office," Bird said. Additional labor was sourced locally. Because Algoma Orchards works year-round processing and shipping apples, Bird said they coordinated with Kirk Kemp to ensure the PV installation wouldn't conflict with the agricultural operation. "You just give them the specifics, and they're pretty organized folks," Kemp said. "They knew what they were doing. It was slick. The place was as neat as a pin when they were done." Bird said the project was pretty matter of fact, and they didn't encounter any major challenges during the eight weeks of installation. The system was commissioned this past July. Based on the positive experience he had, Kemp said his project should encourage other large-scale agricultural operations to do PV solar installations. "For us, this was a lot easier than putting up the building because we had pros doing it, and we're really complimentary of them," he said of RESCo. All of the electricity produced by Algoma Orchards is fed into the Ontario Power Authority's grid. Kemp said he's confident that during the peak periods, the roof-top panels are generating as much or more electricity than the operation consumes. But at night when the sun goes down, he said the PV system isn't running at full capacity. Nevertheless, "it will put back a significant amount of energy we use in the year," he said. The system is expected to generate about 575 MW hours of electricity annually, equivalent to the usage of approximately 48 average Ontario households. At the same time, Algoma Orchards has moved to whittle its $30,000-$40,000-per-month energy bill. It has signed up for the Web-based EnerNOCDemandSMART program, which pays commercial, industry, and institutional entities to participate in demand-response programs. During periods of critical power demand, participants agree to reduce non-essential power use. Orchard's overall operations—production is simply rescheduled. By being a participant in DemandSMART, Algoma Orchards earns about $20,000 annually.